24 LEGS, 24 FEET...WALKING IN THE BEST PLACE ON EARTH. 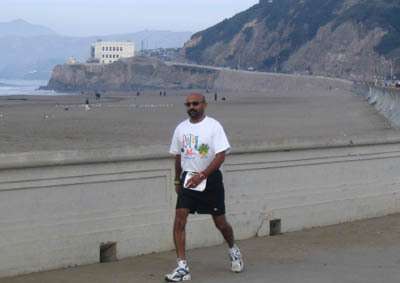 The GGRW is a 125 mile, 12-member team walk from Marin, across the Golden Gate Bridge to the ocean, promoting donation through Organs R Us ("ORU"). Pledge your support for 125,000 Americans waiting for organ donors (see Fundraising). Entry opens each year on September 1 and closes on April 1. Match and make new friends or enemies! Matching has resulted in two marriages. Captains must check in one hour prior to the assigned start time. are calculated using walker paces to reduce congestion and ensure that teams do not miss the fun by walking ahead or behind the race. 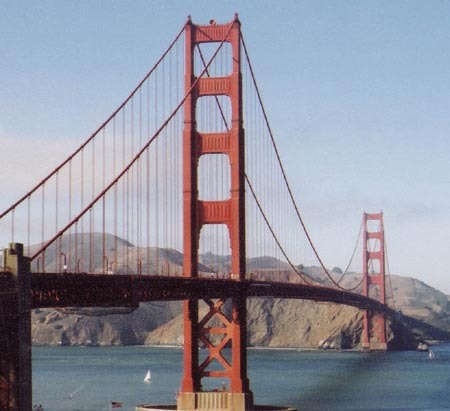 Boasts the largest number of tourist destinations of any walk with 24 legs (two legs per walker, 37 miles each) through 28 cities and across the Golden Gate Bridge. Walk Legs are numbered 13-36 (and not 1-24 to avoid issues with emergency responders, volunteers and permits). Walk on the Right (with traffic) except Leg 18. Obey the California Vehicle Code including stopping at red lights and crossing roads in crosswalks or at intersections. There are no road closures, traffic control or aid stations. Exercise caution always. with awards, exhibitors, food, music and view of the Pacific Ocean. Walkers may cross the finish as a team. Captains: register your team and mail one (1) $720 nonrefundable check via US mail postmarked by March 1. 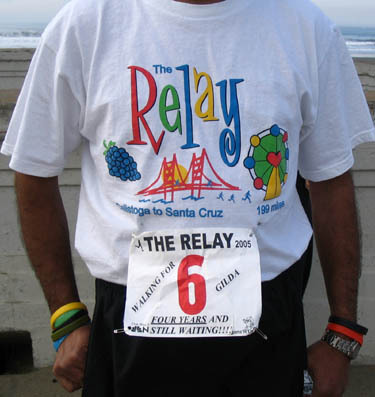 Teams may participate with 12 or fewer walkers. Donation to ORU: $600/team ($50/walker) minimum is due April 15 (see Fundraising). Walkers: confirm team entry at Registered Teams, and register by March 8 to avoid late fees. Safety: Teams must provide two flashlights, two reflective vests and two vehicle signs, "CAUTION-WALKER ON ROAD" (minimum 17 x 22 inches); bring signs or purchase at Start. From sunset to sunrise, wear reflective vests and carry lighted flashlights (see Rules). Reflective vests are recommended during daylight to increase visibility, especially on blind curves. Vehicles: Teams must provide two vehicles (maximum 6.5 x 19 feet). No buses, extra vehicles, limousines or motor homes. Vehicles may not trail walkers, but must drive ahead to ready the next walker. At Exchanges, only Active Vans (vehicles waiting for incoming walkers) may park. Active and Resting Vans may park in Van Exchanges (18, 24, 30). Volunteers: If any walker lives within 50 miles of the course, two volunteers, age sixteen or older, must register by April 15. On a first come basis, volunteers may choose a 4-5 hour shift along the course. Teams with every walker living more than 50 miles from the course are exempt from the volunteer requirement. Follow the Rules and obey the California Vehicle Code. Park safely off the road. Do not obstruct traffic or private driveways. Do not force walkers onto the road by obstructing the shoulder. Only Active Vans may park in exchanges. Stay off the road and away from the Baton Exchange Area unless waiting to receive the baton. Use bathrooms or portable toilets and not private property. Keep Exchanges clean, dispose of trash and be quiet at night. Be courteous and express thanks to law enforcement, property owners and volunteers. Many companies sponsor teams and display corporate names on shirts/vans and feature company teams in corporate communications. Donations to teams may not be deducted as charitable contributions to Organs R Us. View sponsor benefits. NBC 11 provides pre-race and race coverage. Many participants contact local television and newspapers with team stories resulting in more than 100 articles. (See Press Release).